Tolling grimly higher, the recession snatched more than 650,000 Americans' jobs for a record third straight month in February as unemployment climbed to a quarter-century peak of 8.1 percent and surged toward even more wrenching double digits. The human carnage from the recession, well into its second year, now stands at 4.4 million lost jobs. Some 12.5 million people are searching for work - more than the population of the entire state of Pennsylvania. No one seems immune: The jobless rate for college graduates has hit its highest point on record, just like the rate for people lacking high school diplomas. The wintertime blizzard of layoffs - nearly 2 million lost jobs in just three months - is destroying any hope for an economic turnaround this year while feeding insecurities among people who still have jobs as well as those who desperately want to find work. "In this economy, if you have a family to feed like I do, beggars can't be choosers," said Greg Ovetsky, who lost his job at an information technology company two weeks ago. Ovetsky, 37, of Staten Island, N.Y., said he'll take any position. "You can rest assured I'll say yes. Get a paycheck, get food on the table." President Barack Obama, barely a month into his own new job, acknowledged the layoffs were coming at an "astounding" clip but urged Americans to allow him time for his economic revival policies take root. "This recovery plan won't turn our economy around or solve every problem," Mr. Obama said. "All of this takes time, and it will take patience." For a day, Wall Street seemed to agree. Stocks seesawed up and down before finishing with a modest Dow Jones industrials gain of 32.5 points. Still the Dow was down a dispiriting 6.2 percent for the week. The Labor Department's report, released Friday, showed pink slips nationwide hitting all categories - blue-collar, white-collar, highly educated and not. Employers slashed payrolls by a net total of 651,000 last month - the third month in a row that job losses topped 600,000. It was the first time that's happened in government record-keeping dating to 1939. "These are gargantuan declines," said Stuart Hoffman, chief economist at PNC Financial Services Group. Employers also are holding hours down and freezing or cutting pay as the recession eats into sales and profits. The unemployment rate leapt to 8.1 percent from 7.6 percent in January, the highest in more than 25 years. 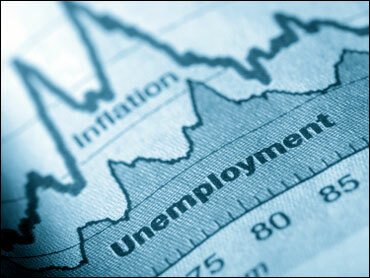 Economists expect the unemployment rate to continue for months, reports CBS News correspondent Anthony Mason. "The fiscal stimulus plan hasn't kicked in. The stock market's continued to fall," Hoffman said. "So at this point, relief may be on the way, but it has not arrived." Not in Dalton, Georgia - with the housing slump, unemployment in the country's carpet capital has soared to 12 percent, the second highest in the nation, reports Mason. "This is a town where two years ago the unemployment rate was, in effect, zero," said Pastor Bill Wilson of Dalton's First Baptist Church. He has started serving meals twice a month to help out. "It started with 35 people for a meal and now there were 350 here last night," Wilson said. Besides the 12.5 million total for unemployed people in February, the number of people forced to work part time for economic reasons rose by a sharp 787,000 to 8.6 million. Those are people who would like to work full time but whose hours were cut back or were unable to find full-time work. If those people - along with discouraged workers - were factored in, the jobless rate would have been 14.8 percent in February, the highest in records dating to 1994. The jobless rate for people with bachelor's degrees or higher jumped to 4.1 percent. And the rate for people without a high-school diploma climbed to 12.6 percent. Both are the highest in records dating to 1992. The jobless rate for blacks rose to 13.4 percent, the highest since June 1993; the rate for Hispanics hit 10.9 percent, the highest since April 1993. With no place to land, the number of "long-term unemployed" - those out of work for 27 weeks or more - climbed to 2.9 million, the most in records back to 1948. Construction companies eliminated 104,000 jobs last month. Factories axed 168,000. Retailers cut nearly 40,000. Professional and business services got rid of 180,000, temporary-help agencies 78,000. Financial companies reduced payrolls by 44,000. Leisure and hospitality firms chopped 33,000. The few areas spared: education and health services, as well as government, which boosted employment last month. For those with jobs, employers kept a tight rein on hours. The average workweek in February stayed at 33.3 hours, matching the record low set in December. Disappearing jobs and evaporating wealth from tanking home values, 401(k)s and other investments have forced consumers to retrench, driving companies to lay off workers. It's a vicious cycle in which all the economy's problems feed on each other, worsening the downward spiral. A bit of positive economic news came from the Federal Reserve, which reported that consumer borrowing increased at an annual rate of $1.76 billion in the first month of the year. Still, the small rise is unlikely to shake economists' views that borrowing will remain weak this year as fearful consumers tighten their belts. The economy contracted at 6.2 percent in the final three months of 2008, the worst showing in a quarter-century. Analysts believe the economy in the current January-March quarter is contracting at a pace between 5.5 and 6 percent or more. A new wave of layoffs hit this week, with General Dynamics Corp., Northrop Grumman Corp., Tyco Electronics Ltd., and others announcing job cuts. Mr. Obama is counting on a multipronged assault to lift the country out of recession: a $787 billion stimulus package of increased federal spending and tax cuts, a revamped bailout program for troubled banks and a $75 billion effort to stem home foreclosures. But economists said the jobs situation seems to be killing any hopes for an economic recovery later this year as some had hoped. "Faith in a rebound is running low no matter where you look these days," said Stephen Stanley, chief economist at RBS Greenwich Capital.